History is determined by whoever holds the pen, be it religious context, political misconduct, or something as simple as creative rights. Anyone who knows me personally knows I’m a huge comic book fan, for Batman especially. Much like “The Death of ‘Superman Lives’: What Happened,” Batman & Bill is something I’ve been following for a few years now, and have been excited for Hulu to post ever since it was first advertised. What I like about the direction is that it starts from a fan’s perspective, sort of making Marc our hero, describing his life, fascination with Finger and previous works, which includes a book on the creators of Superman. The documentary also places a lens on them later on, and the legal struggles they also suffered over ownership of Superman. So not only does it establish what horse Marc has in the race, but the precedent of creator shortchanging in the past. Bill Finger, despite being a driving force behind the overall direction of the character and mythos (a cash cow that has been a staple of popular culture of over 75 years), it’s Bob Kane, who came up with the initial broad concept, who proceeded to claim sole ownership of the character. The film begins with Marc raising awareness for the man, turns into a journey to discover any surviving heirs, and ends with his contributions partially inciting DC Comics to give Bill Finger credit on Batman related projects going forward. The journey takes many twists and turns and the level of desiccation towards what should’ve been the man’s legacy is both engaging and sad. Make no mistake about it, Bill Finger died penniless and alone. And whilst the film obviously vilifies Bob Kane, I believe it does it from an honest place, and does credit Kane with what he actually contributed, and provides sort of a bittersweet moment for him later. Like most documentaries, there usually has to be an interest in the subject material to begin with to really coax a viewer into wanting to learn something. But since the framework is about something so simple and poignant and Batman has always been such a phenomenon, I would say this is certainly more accessible than “The Death of ‘Superman Lives’: What Happened,” at the very least. Whereas that focused on an unmade project one might be morbidly curious about, this is about the genesis of an icon from its initial conception. If there is one criticism to make, it is that I feel we could’ve learned more about Bill Finger’s work outside of Batman, as his contributions are numerous and go beyond just The Dark Knight (a nickname he also created). But, I can see why it wasn’t included just to keep the focus consistent, especially since the goals continue to escalate and shift. 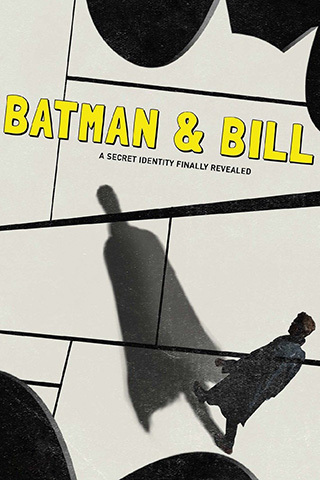 I’d recommend Batman & Bill to anyone who’s a creator, has an interest in the creative arts, or just any Batman/comic book fan in general. It’s fascinating to know what the real truth is versus the idealized facade we can be presented sometimes with by those who just happen to pull the rug underneath our feet or sprint to the patent office a little faster. It is a Hulu documentary so don’t expect a physical copy anytime soon, but I imagine a free trial or a month’s fee wouldn’t hurt just to give this a peek.